This book came to see light of day after I had gone through an old photographic family album. 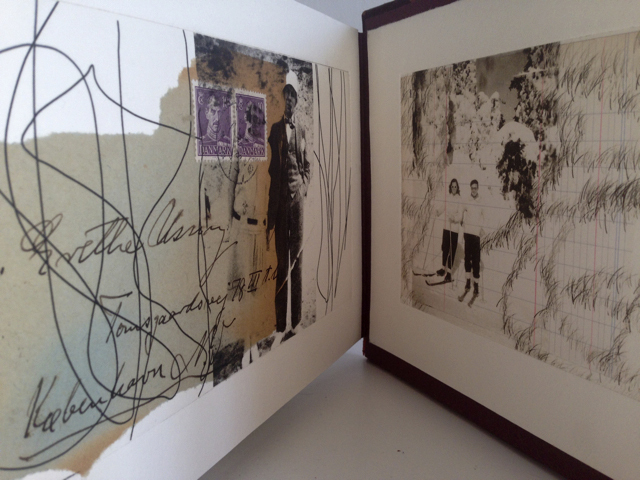 The book consists of old family photographs on both sides of my parents printed as photogravure and as chine collé I have partly used written original letters from family members too. Printed as photogravure, chine collé, with Gutenberg and Charbonell ink on Zerkall Wove 340g. The red cover is from an old book, chosen format is leporello. printed and bound in Copenhagen in 2015, 9 pages + colophon. Overall size when book is closed: 17.5 x 26 x 2 cm. Open measurements is 153 cm length. Unique book.